I ate this ice cream for lunch. I didn’t mean to. But I was photographing it, and I just couldn’t resist. And let me tell you it is one of those treats where there was no doubt in my mind it was worth every single calorie. I mean just look at it! 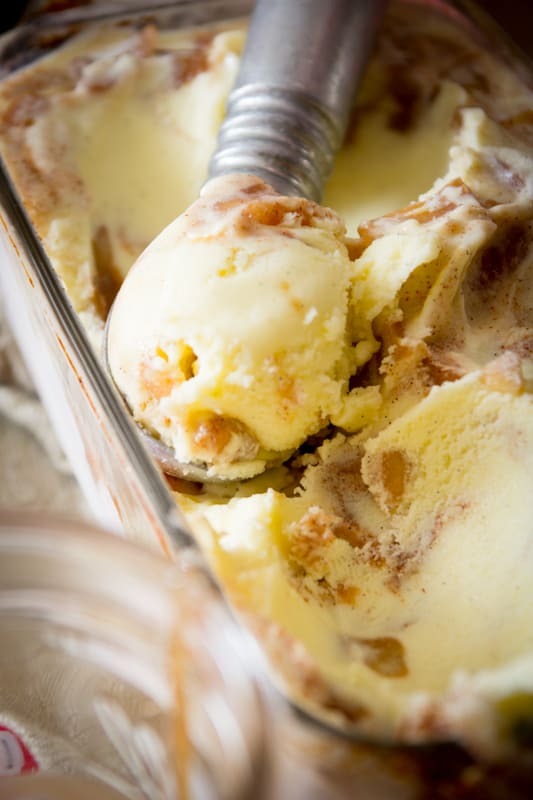 Creamy vanilla flecked ice cream swirled with apple pie filling with brown sugar and cinnamon. What is not worthy of caving-in about it? There’s also that it smells so good too, the smell of it is the stuff candle scents are trying to emulate. But this is the real deal. It is vanilla bean and cinnamon and cooking apple pie all wrapped up in one freakin’ delicious treat. 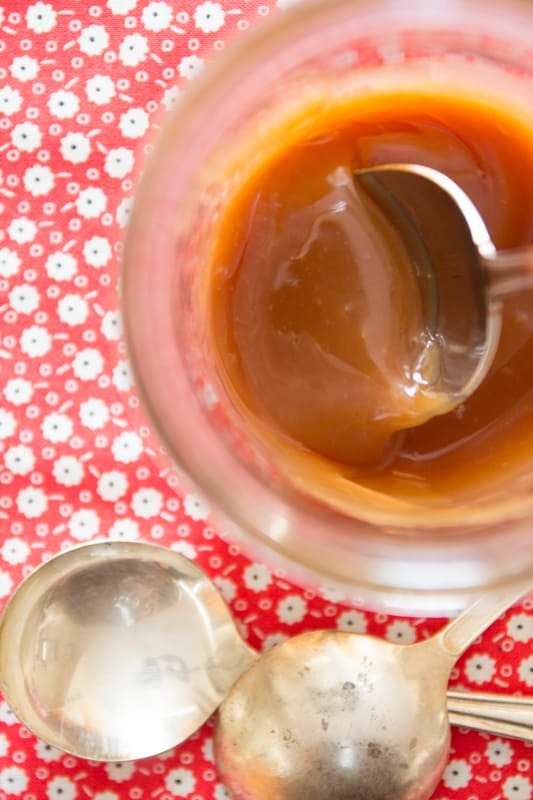 And then there’s the salted honey caramel. Ohh why did I have to go and do that? Any sweet and salty combo pretty much renders me powerless. Like this Vegan Chocolate Pie with a pretzel crust. I repeat pretzel crust!! Swoon….Powerless I say. I do have to say though, that while I am not condoning my actions, I do have to say as far as treats go, this is not as unhealthy as it gets. Yes it has a little cream in it, but really you’re only getting a half of a tablespoon per serving. [And that stat is counting the sauce too.] And that little bit of cream really helps make this, well creamy-tasting. Also helping that factor, but without any added calories is a secret ingredient! Unflavored gelatin. I learned about that in the Eating Well Test Kitchen. And the majority of the base is low fat milk and apples. It’s practically health food! Okay, it’s not, but I say sometimes it’s okay to have ice cream for lunch. And sometimes it’s fine to have Caramel Apple French Toast Casserole for breakfast. Then you can go back to eating healthy the rest of the time and not feel like you’re missing out. How about you? 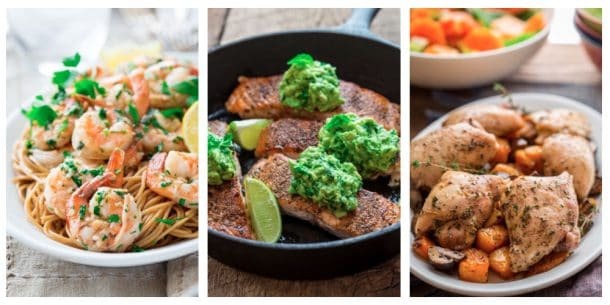 Do you ever indulge and then go right back to eating healthy? If you’re gonna cave, what’s worth it to you? Apple pie flavored ice cream. Reduced-fat vanilla ice cream with a swirl of apple, cinnamon and brown sugar. Served with salted honey caramel sauce. Freeze ice cream insert if necessary at least 24 hours in advance. 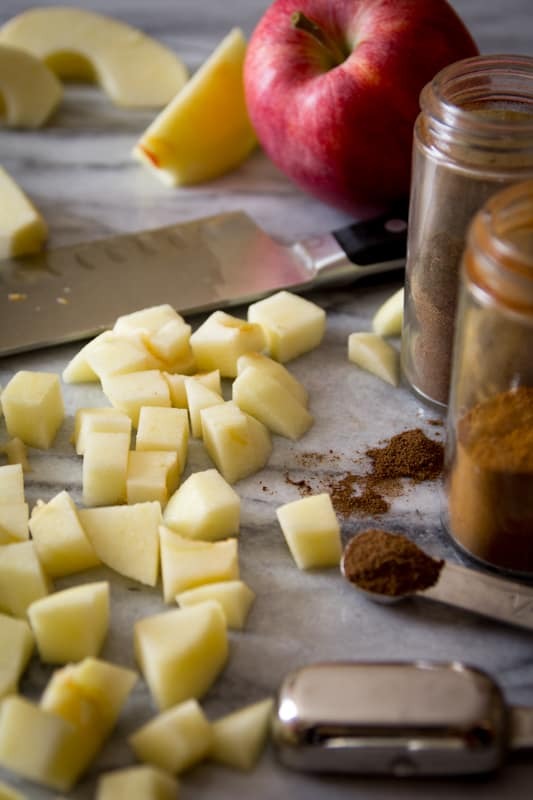 Stir apple, brown sugar, cinnamon, allspice and salt in a medium saucepan. 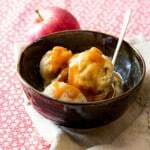 Place over medium heat, cover and cook, removing lid to stir often, until the apples are tender, and the brown sugar sauce is thickened, 5 to 8 minutes. Spread apple pie mixture out in a rimmed baking dish and refrigerate until cold, about 1 hour. Pour whipping cream into a small dish. Sprinkle gelatin over the cream to “bloom.” Set aside. Slit vanilla bean in half lengthwise, and scrape out seeds with the back of a knife. Scrape vanilla beans into a medium saucepan. Add pod and milk and place over medium-high heat. Heat until the milk mixture is steaming hot. Remove from heat. Whisk yolks and sugar in a medium bowl. Gradually pour in milk, whisking constantly. Return mixture to the saucepan and heat over medium-low heat, stirring with a wooden spoon, until the mixture thickens and coats the back of the spoon. You can tell it is ready by dipping a spoon into the custard, and then run your finger across the spoon, if it leaves a clean line, the mixture is thickened or nape. Remove from the heat and whisk in gelatin mixture until smooth. Pour custard through a fine mesh sieve into a medium bowl. Set bowl into an ice bath to cool quickly, or transfer to refrigerator. Stir occasionally to speed cooling process. Add ice cream custard to the ice cream maker and process according to manufacturers instructions. When the ice cream is firm transfer ½ to a metal loaf pan. Dallop half of the apple mixture on the ice cream. Add second layer of ice cream, and then top with the remaining apple mixture. Swirl and gently stir with a clean knife. Freeze until it is solid, about 4 hours. Stir ½ cup sugar and water in a clean dry saucepan. Add honey and stir to combine. Place saucepan over medium heat, and heat stirring frequently until the sugar has melted. Put an inch or so of water in a mug with a clean pastry brush. Brush sides of the saucepan down with the wet brush to wash any sugar crystals into the syrup. Leave syrup undisturbed once it comes to a boil and all sugar crystals are dissolved. Let boil until it reaches 310 degrees F. Remove from heat and add whipping cream (mixture will bubble vigorously.) Stir to combine and add salt. Stir and let cool before serving. 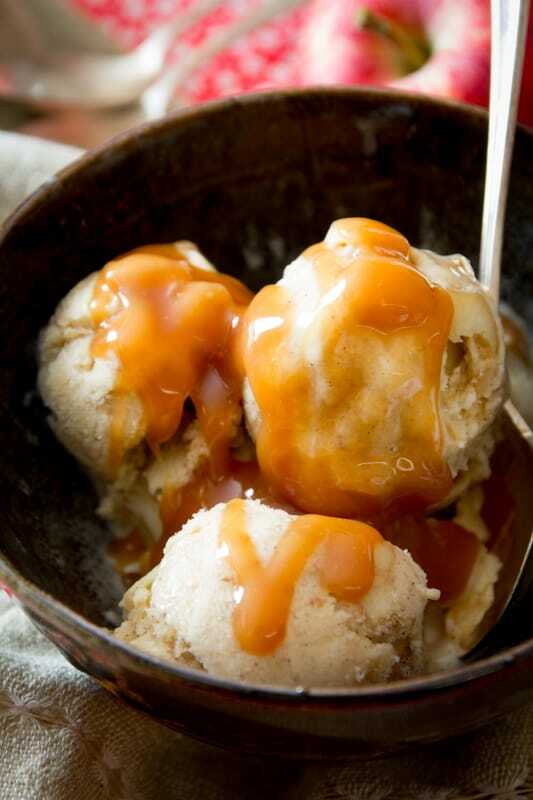 Serve ice cream with caramel sauce. sounds like a delish flavor! Yes I’d have to say it is splurge-worthy for sure. This looks amazing, Katie! I may be drooling just a little bit. Glad you mentioned that about the caramel, because I agree it would be a great gift. This just makes a small amount, it could easily be scaled up to make for gifts. Store in the fridge and just warm it up to serve. And thanks for making me feel a little better about the lunch indiscretion. What a FABULOUS idea! Wow Wow Wow! Hi Katie, Thanks so much for dropping by SBD and I appreciate the comment. I’m so glad to find your blog! It’s really beautiful and I can’t wait to spend more time here exploring your recipes! I love everything about this ice cream recipe! 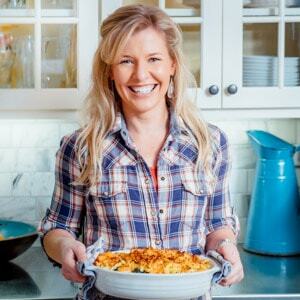 It’s makes me get excited about fall flavors and holiday dishes! Thanks for a great post! WHOA! When I make low fat ice cream, it NEVER comes out looking like that. In fact, that’s why I almost never make it. It always tastes good, but gets that icy texture. That gelatin idea is genius! Wow, this is my kinda ice cream! I love salted caramel. Thanks Gerry. Yes a bit of salted caramel does make everything a whole lot yummier. This recipe looks and sounds amazing! Apples are the perfect treat year round in our family. So, this recipe is definitely one that needs to be made soon! Thanks for sharing! Thank you so much Caryl Anne! This looks perfect for this apple pie lovin’ girl. One question: rum? The recipe says to combine whipping cream and rum in a small dish. I went over and over the ingredients. Didn’t see rum anywhere. Did I miss something? Can’t wait to try it. Thanks for the effort you put into your wonderful blog! I think that is a legacy from a previous test. I ended up removing the rum from the recipe because it was too overpowering. So just ignore that, and I will edit. Thanks for pointing that out.